There are numerous hotels with their own particular styles. 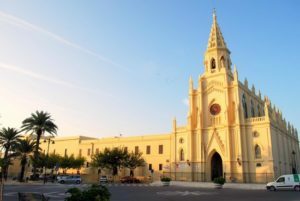 Chipiona has long been a popular tourist destination so there are many outstanding places in which to stay. Click HERE to see available places to stay in Chipiona. 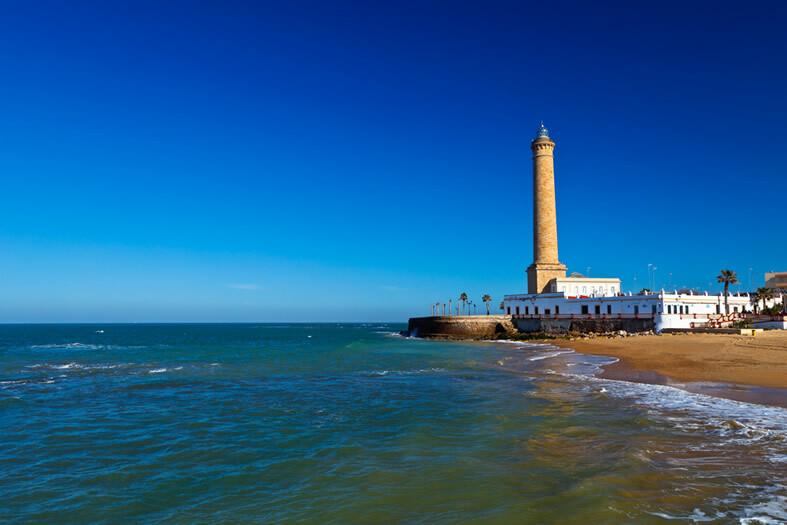 The name of the town is derived from the old “Chipiona” Lighthouse, which is the oldest and most notable monument in Chipiona. 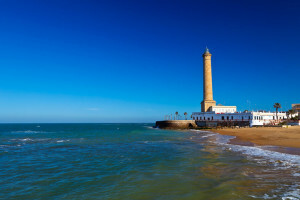 The lighthouse is situated at Punta del Perro at the mouth of the river Gadalquivir. It was built to warn ships away from the large rock, Piedra de Salmedina. Despite the lighthouse´s presence, this rock has been responsible for many wrecks over the years. Visitors can tour the 69 metre high lighthouse and climb the 344 steps leading to the very top of the lighthouse. It is the tallest in Spain and remarkably, the third tallest in the world. On a clear day, you can enjoy views of up to 25 miles of the entire area, which are truly magnificent. They include sea views and other sights such as the cloister of the Sanctuary, the Cuzmán el Bueno Castle and the parish church, as well as the typical fish traps, for which the area is so famous. 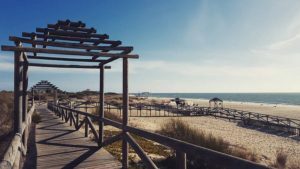 Chipiona boasts some beautiful beaches, frequented by many people living in and around Seville. However, the area is gradually opening up to international tourism. Chipiona was re-conquested by King Fernando III who built the castle in 1295. Today the castle is a monastery which is open to visitors. Formed by the action of the two rivers, Gaudalquivir and Gaudalete, the countryside around Chipiona consists of a very fertile plain covered with greenhouses used for the production of cut-flowers and other market garden produce. Along the coast the sand dunes and marshes that are ideal for many varieties of wildlife. Main agricultural products include: wine growing and tomatoes. The area produces sweet Moscatel wine, sherry and wine vinegar. Visitors can visit and taste at the local wine producers as well as taste at the Bodega Cesar Florido and the Bedeguita de Castillito (Calle Castillo, 1). The tradition of winemaking dates back some five centuries where muscatel grapes have continued to grow in a mixture of clay and sand, producing a much sought after quality and flavour. Fishing is the oldest trade in Chipiona from which the population has been making a living over the centuries. Fishing in Chipiona is famous for its high quality and its traditional techniques, as is that of neighbouring town, Sanlúcar de Barrameda . Chipiona is characterized by the Chipiona fish traps, near Playa Las Canteras expertly built stone walls that begin at the coast and become higher as they stretch out to sea. The fish are trapped here by the tide. Locals use this traditional fishing technique, making use of low these low lying stretches of irregular red sandstone. One of the most popular pass times today in the Costa de la Luz is golf and the 18 hole, par 72, course at the Costa Ballena Club, designed by Maria Olazabel, attracts many enthusiasts. Such as surfing, sailing, kite surfing and windsurfing are also popular activities in the area and the waves and large stretches of beach are ideal. 16th July the procession of the Virgen del Carmen is a majestic marine procession through town. In August the town´s fiesta announces the grape harvest and in September the Vigil of Nuestra Señora de Regla takes place on the beach where music and local wine are the main attractions.